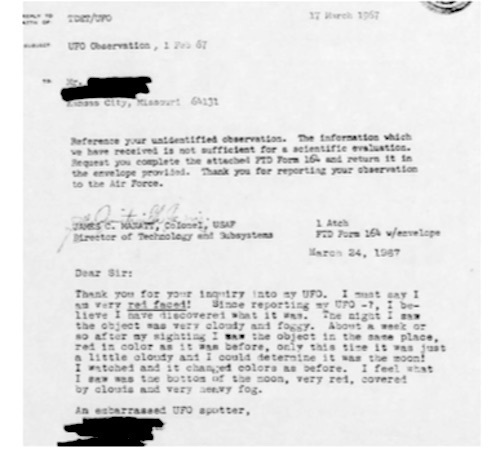 Clark’s misleading comments about Dr. Tarter is indicative of how UFOlogists dislike skeptics. He ignored the fact that she identified her UFO shortly after seeing it. Dr. Tarter was simply trying to demonstrate how she initially was confused by what she was seeing. If we put aside Jerome Clark’s personal attack on Dr. Tarter, we have to wonder about his other claim that “any Joe Doakes” could easily identify the moon. I found it interesting that Clark, in making his statement, seemed completely ignorant of how the moon has been misperceived as a UFO. Allan Hendry noted that 2% (22 reports) of his nocturnal light UFO sightings were of the moon.2 He even had one sighting that involved multiple police officers in separate cars pursuing the setting moon! It seems hard to believe but, as UFOlogists like to point out to skeptics, you have to keep an open mind about these things. 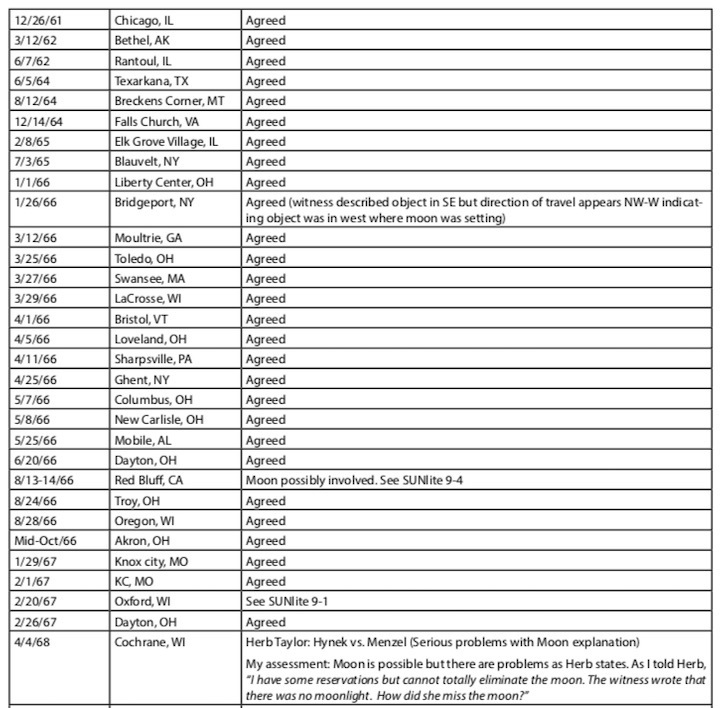 Herb Taylor recently gave me a list of all Blue Book (BB) files that he found involved the moon.3 He included my reclassifications in the list but, while I had exchanged some e-mails regarding a few of these cases with Herb, I had not reviewed all these cases. As a result, I decided to go through his list and, like my BB reassessments, listed if I agreed or not with the conclusions. It seems almost impossible that this could be so, but obvious mistakes are frequently made, and the moon, when rising, and viewed through scudding clouds and perhaps additional meteorological conditions, can fool people. We do have documented cases in which the setting moon has been the source of several UFO reports. 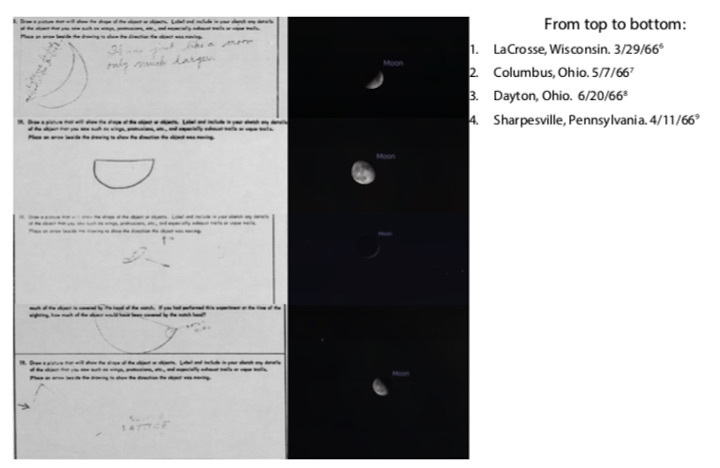 In another instance, the witness admitted they had made a mistake on their initial UFO report and, after watching the moon rise a week later, they realized their initial report was the moon! 29, 1967. In this case, Hynek agreed with the conclusion by initially the solution. the reasons to believe that what was seen was the moon. 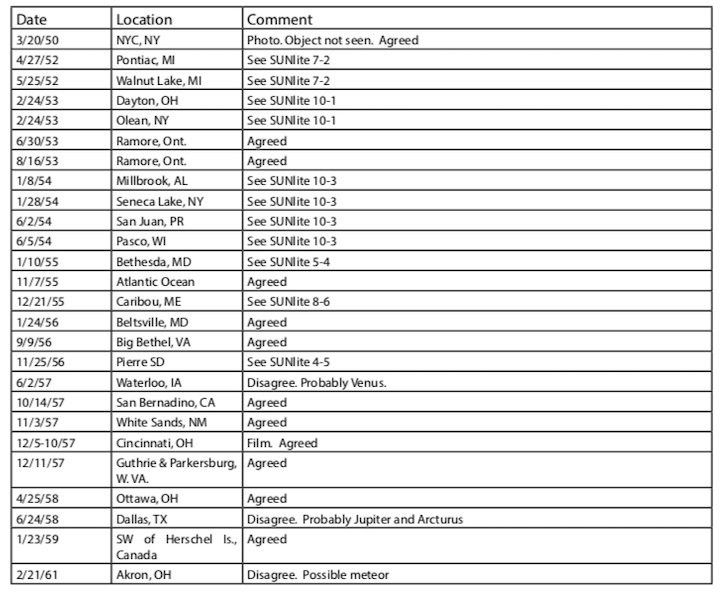 of the UFO report before promoting it as being “unidentified”.